I am so looking forward to the long weekend ahead, three days to relax and enjoy family and friends. At our gatherings we are all responsible for bring a dish. Guess what I’ll be taking! I grew up eating loads of watermelon, it was a summer staple in our house, but we couldn’t eat it in the house. My mother made my siblings and I eat our watermelon outdoors when we were young, when we were older and bit more mature, she allowed us to eat it inside. 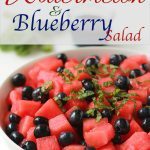 You can serve this watermelon salad in or out and you don’t have to worry about a big dripping mess. This is my second summer being able to eat watermelon without getting sick, and I’m enjoying it. I’m not sure what it was, but several years ago whenever I’d eat it, I would get oh so sick, so I stopped eating it. Last summer I gave it a try, because I really, really wanted to have some crisp, sweet watermelon. I started with small pieces, didn’t get sick, I now sometimes eat half of a watermelon for breakfast , yeah!! Watermelon contains lycopene, a nutrient found in red fruits and vegetables and aids in vision, heart health and cancer prevention. Watermelon is such a filling food, and it’s only 40 calories per cup, you can’t beat that. Now that I’m eating more watermelon, I’m eating it more ways. 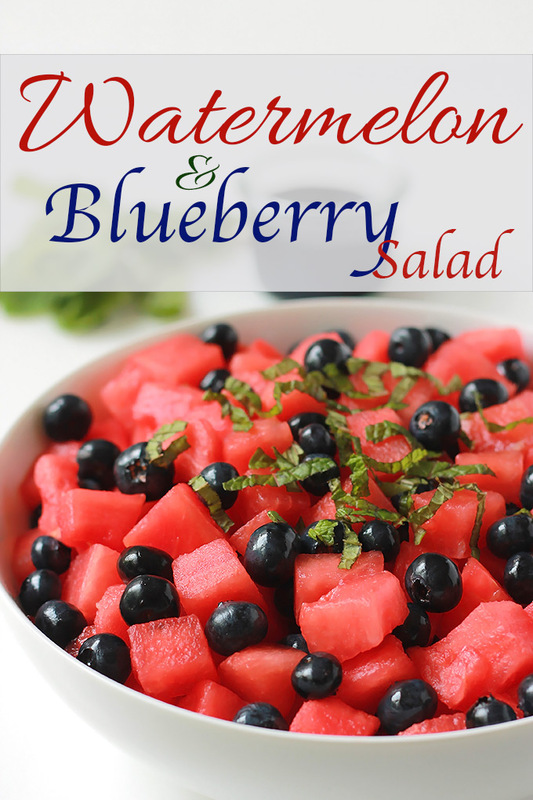 This simple salad is so delicious and festive looking, perfect for your Memorial Day gatherings. 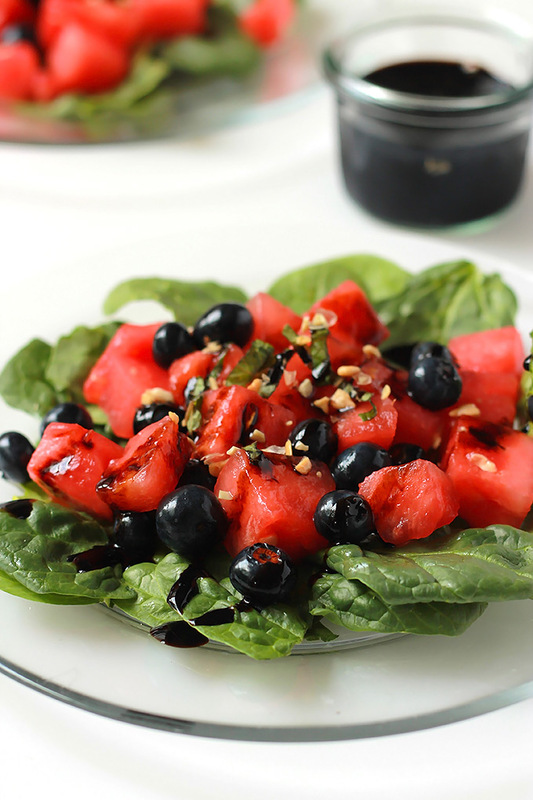 Serve along or on top of a bed of greens, drizzled with balsamic glaze and sprinkled pine nuts. Finding a sweet watermelon can be hit or miss, so I sometimes drizzle on a bit of agave nectar. 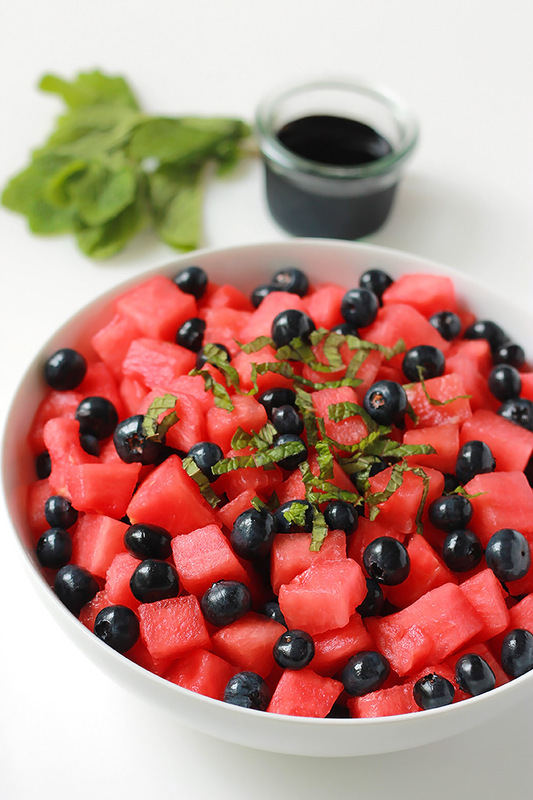 In a large bowl toss cubed watermelon with blueberries. Add in the lime juice and sprinkle on a bit of agave nectar if you like. I generally add agave if my watermelon is not a really sweet one. Finding a sweet one is hit or miss. Toss to mix, transfer to serving dish. Yeah, I like simple, and this my just become my go to summer take-along dish. Enjoy and have fun with it this summer. Thanks for stopping by and leaving a comment, I love to know what my reader think. This is unbelievably lovely. So glad I stumbled upon your blog. Thanks so much Jocelyn, I actually follow your blog, I have it bookmarked on my tablet. 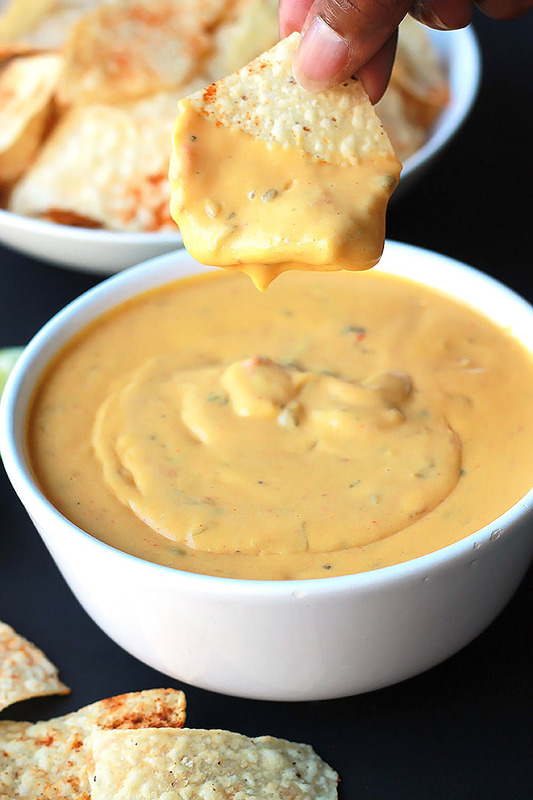 This looks delicious (and beautiful!). Thanks for sharing with us at the Inspire Me Mondays Link-Up! You are so welcome. 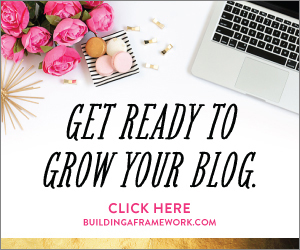 Thanks for hosting an Inspiring Link-up. Your blog is quite lovely by the way. 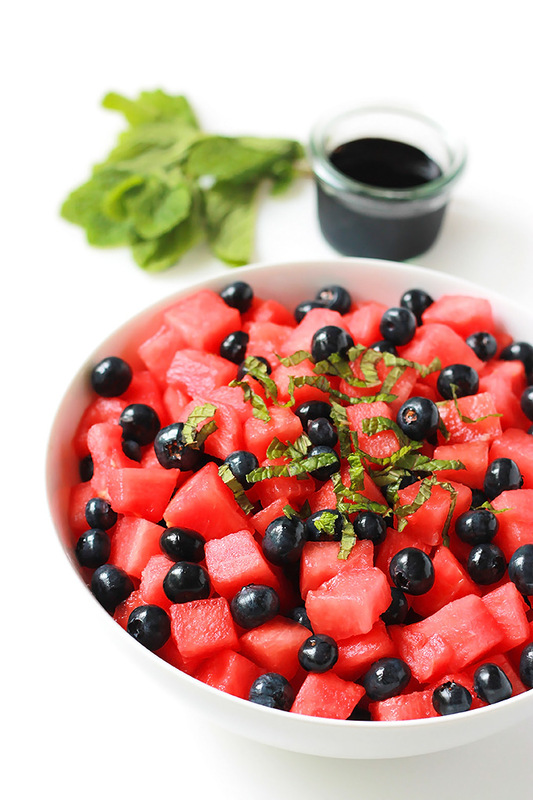 I could eat this salad everyday, I love watermelon. Thanks Christine for the compliment about my photos and thanks for stopping by. I remember eating the old-fashioned watermelon, always outside and always spitting the seeds.Even the so called seedless are not completely seedless, my daughter hates having the seeds in her watermelon. I simply eat the tiny seeds because it’s too much trouble to pick them out. Nice plating! This salad looks very delicious. A good food to have after a sumptuous meal over dinner. Thanks Kelly for including my recipe in your list. Have a great weekend.